Erivum Puliyum: Bread Pakoras with a touch of Cilantro !! -Make a batter using the ingredients listed under batter and keep aside. (The batter should be of dosa or pancake consistency). -Remove the crust from all sides of bread.Cut the bread slice into 3 parts. -Heat oil in a kadai and check whether the oil is hot by dropping a bit of batter,if it sizzles up its done. -Dip each bread slice into the batter and slowly spoon into the boiling oil. 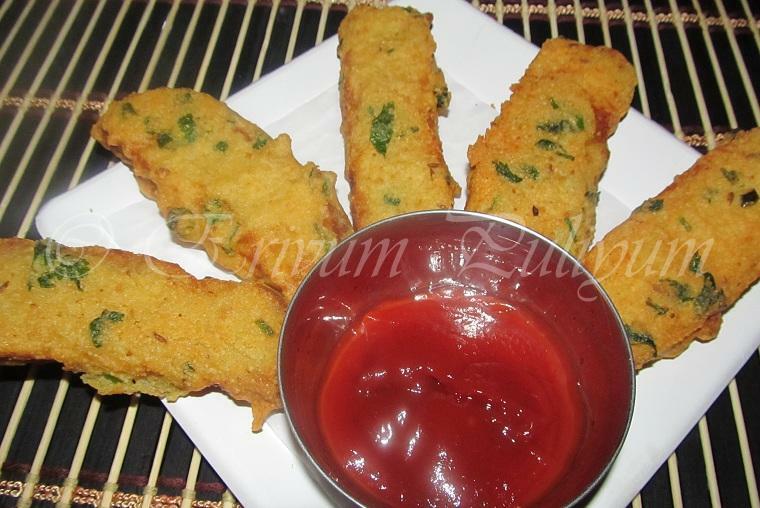 -Serve with green chutney/ tamarind chutney/ tomato ketchup !! * You can use your preferred bread,I have used whole wheat& honey bread. * Don't over heat the oil otherwise the pakoras may not cook well.Cook on medium heat. * You can replace cilantro with fenugreek leaves or spinach leaves. Delicious snack.. Would love to have it now with coffee.. Its cold and raining here now. i usually toast these pakoras :) but this sounds like a yummy n filling snack...sure kids will love it...looks very tempting Julie! Tempting and addictive snack perfect with a cup of tea....drooling here,liked your new template. I agree Julie that once in a while deep fried is good especially when its a yummy bread pakora :) Yours look too delicious, am craving for these now!! 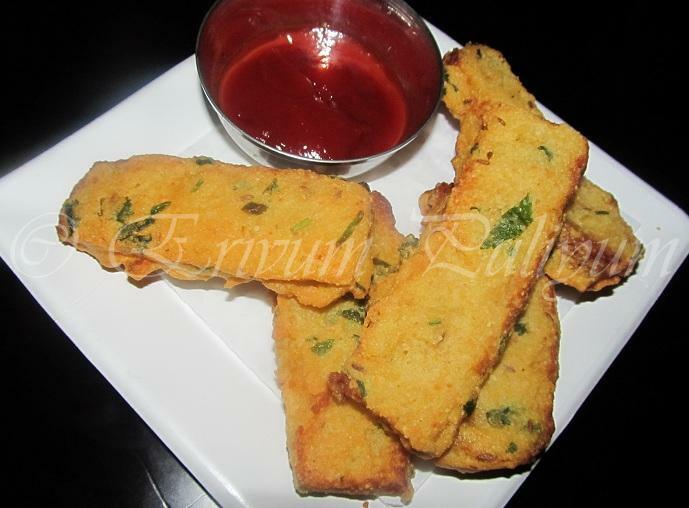 Bread pakoras looks super tempting..drooling over the pics! Yum and crunch pakoras, perfect here for the rainy season. Must be a lip-smacking snack! It's a good idea. The green from leaves (whether cilantro, fenugreek or spinach) sure adds some color to the bread pakoda. Giveaway # 1 - Cupcake Carrier - Bake n' Take! Colorful and yummy..Nice starter Julie. Interesting and easy snack recipe !! i love this bread pakoda..i make it often. Wow, yummy n tempting snacks! How crispy they are na, loving it. Brings back memories of school days...This used to be sold in our school canteen..really hot and tasty...Used to have at least once in 10 days. Hi julie, Your recipe bread pakora looks hot and spicy!!! wow.. ma favourite .. looks crunchy and yummy..
Wow, these look so good.. The other day my punjabi friend made them for a party and I could not stop munching on them the whole time. Delicious bread pakodas. Perfect with evening tea after a tiring day...I loved the long strip shape.